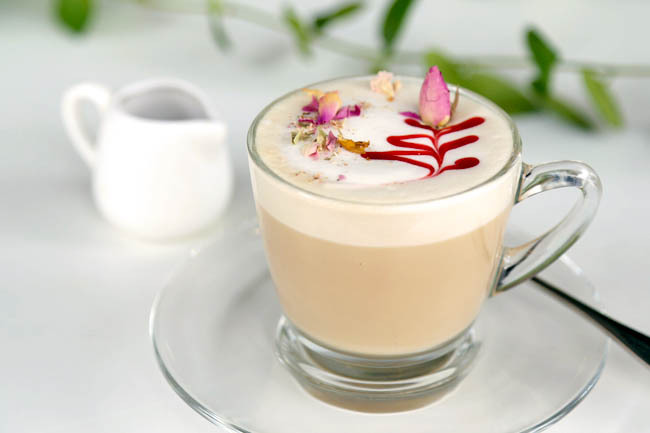 There are some common misconceptions about food served in vegan restaurants – limited choices, plain and boring taste, or too many deep fried items and mock meat items, which is the other extreme. 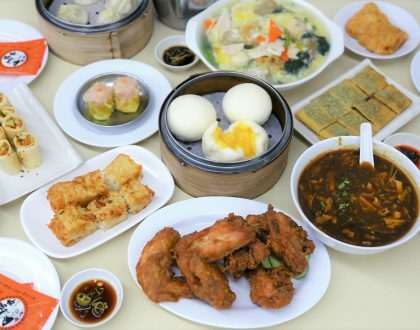 A visit to Loving Hut at Joo Chiat would change that impression. 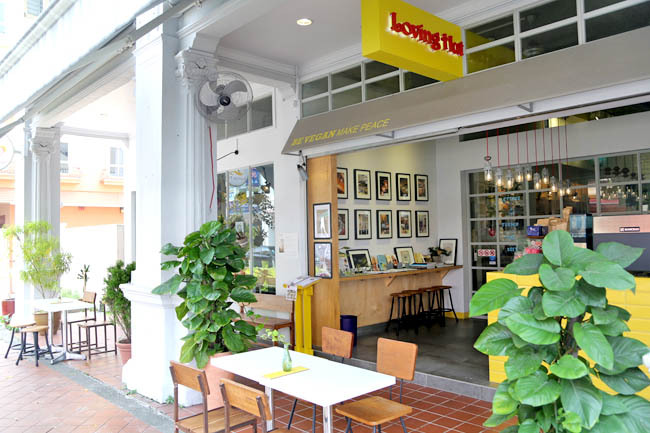 Loving Hut in Joo Chiat has joined the Health Promotion Board’s (HPB) Healthier Dining Programme for both its restaurant and catering arm, aiming to encourage customers like us to consume food with lower calorie and go for healthier options when dining out. 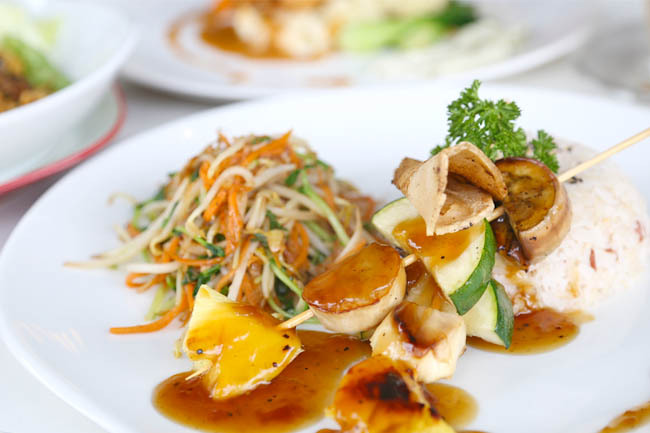 For a restaurant that focuses on 100% plant-based ingredients, the menu is surprisingly extensive – from the local favourite of Nyonya Laksa (462 kcal), Saigon Noodle Soup (353 kcal), Taiwanese style Three Cup Chicken with Organic Brown Rice (471 kcal), Vegan Lasagne (417 kcal), Aglio Olio (448 kcal) to Portobello Burger (500 kcal). The above mentioned are all 500 kcal or less! Here are some of my favourites from the vegan restaurant. Friends told me that I must must must try the Nyonya Laksa Lemak ($8.90) because “it is like the best thing over there”. Never would I imagine laksa of decent portion of any kind to be below 500 kcal. Is it even possible? An average bowl of Nyonya Laksa is already 700 kcal. 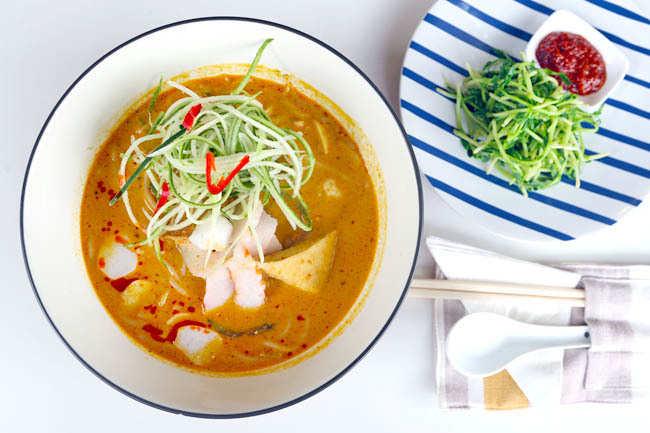 462 kcal – that’s how much Loving Hut’s Nyonya Laksa is worth. To be honest, I was expecting some watered-down, pretty tasteless broth without the creaminess. First sip and I knew I was wrong. 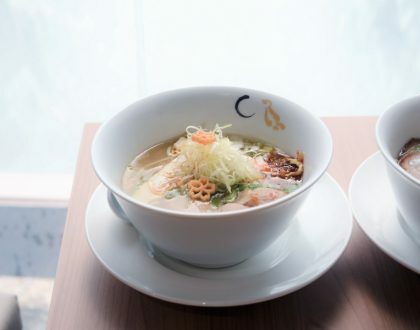 The bowl contained a bed of thick bee hoon bathed in a rich and slightly spicy broth, topped with cool shredded cucumber with additional crunchy dou miao at the side. My next favourite dish was the Teochew Mee Pok ($8.90), a vegan interpretation of the familiar bak chor mee. The calories are about half of what you would expect. 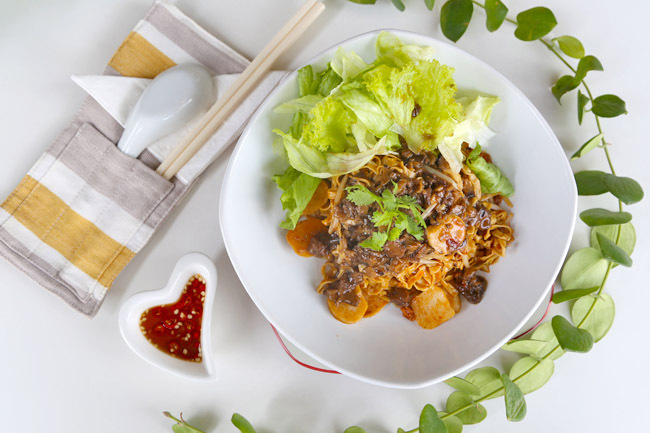 At 270 kcal per bowl of a relatively large size, contrast this with dry mushroom and minced pork noodles which is at 511 kcal. 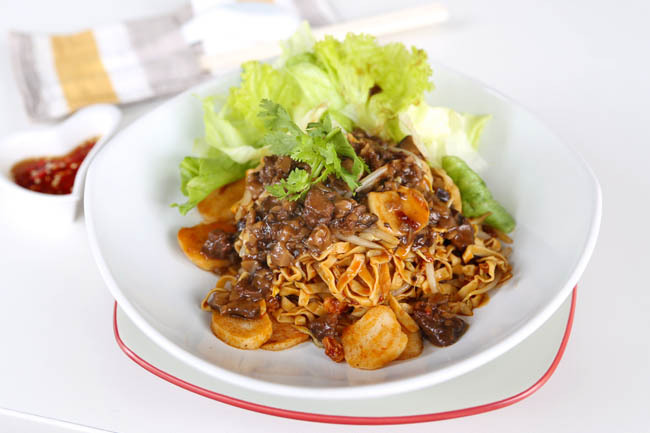 The cut mushrooms were generous in portions, saucy in taste, best savoured when tossed with quite al dente mee pok. A fairly interesting dish which the staff from Loving Hut described to me as ‘vegan steak’, suitable for those who prefer a more Western yet still healthy meal. 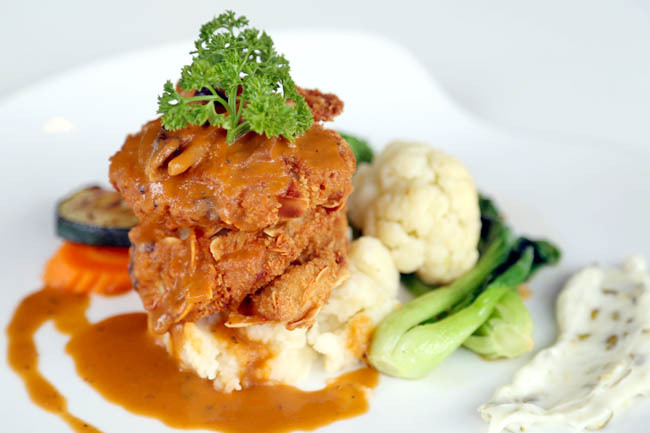 Like a stacked up tower, the dish contains breaded almond crumb on chunk fillet ($14.90), creamy mashed potato and layered with angel dip, served with buttered vegetables. The patty does not feel oily at all, yet can satisfy cravings if you want something ‘guilty-tasting’ – without the additional piled up calories. Talking about ‘guilty’, a burger meal with fries and salad ($14.90) that is 500 kcal? Yes. 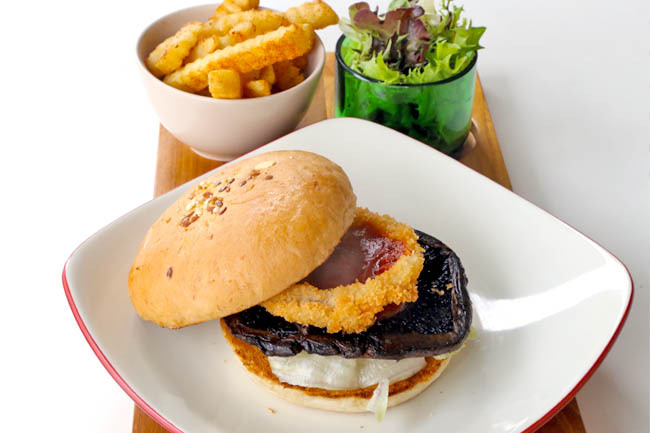 Rather than mock meat patty, you would get grilled Portobello mushroom sandwiched in soft burger, juicy and flavourfully marinated with mixed herbs and olive oil. 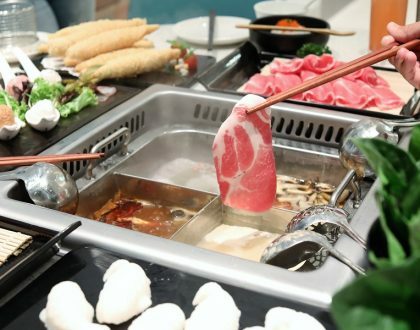 Available as part of the weekday lunch special, this skewer dish ($6.90) made with mushroom and fruits on stick, drizzled over with specially made brown teriyaki sauce, and served with colourful fresh teppanyaki vegetables is filling and lower in calories at 445 kcal. Plus very reasonably price. Tip: If you drop by on a Friday noon, try the lunch special of Vegan Kway Chap, at 366 kcal. For meat lovers out there, who like myself had some common misconceptions about vegan food, my suggestion is to try the vegan dishes and not compare them to meat dishes you are used to (No “this doesn’t taste like chicken”) but to appreciate them as they are. 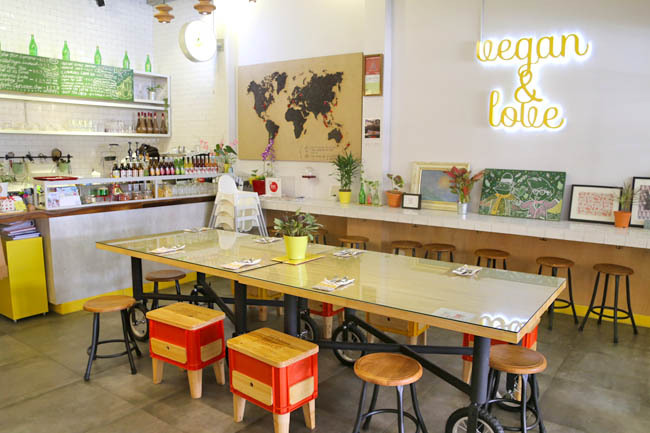 You may find yourself loving Loving Hut (pun not intended) for its sincerity in service, variety in cuisine, and commitment to provide healthy yet tasting dishes. I was pleasantly surprised. I follow you for several months. How do you manage that your videos always so bright and look good? It would be great if you could make a making-of video about what you do in a restaurant.